→On Wednesday, December 11th, East Passyunk Ave. is getting boozy with the Santa Craft Beer Crawl. Fourteen award-winning bars, including Stateside, Lucky 13, Bottle Shop, Birra and Stogie Joes, will open their doors ready to sling pints of seasonal craft beers and mix up holiday cocktails for one and all. Tickets, which get you $3 beers, $4 cocktails and $5 plates, are just $5, and can be purchased here. Bonus: you’ll receive a Santa or elf hat at registration. Even better bonus: proceeds from the event will benefit local families in need through East Passyunk Crossing’s holiday giving program. The fun starts at 5:30PM and wraps up at 9:30. →The City of Brotherly Love’s first open air artisan and antiques market, The Philly Mart, will present it’s inaugural event, a Pop-up Holiday Extravaganza, on Saturday, December 14th from 11AM-6PM, and Sunday, December 15th from 11AM-5PM at 4120 Main Street in Manayunk. Attendees will be invited to browse (indoors, don’t worry) a variety of original art, photography, housewares, collectibles, jewelry, up-cycled glassware, ceramics, knot wear, art prints and more—all made by 30+ artisans from Reading to South Jersey. Make sure to check out The Philly Mart’s social media promotions which benefit Toys for Tots. And, if you’re able to attend the event, remember to bring an unwrapped toy to donate (it just might score you some Philly Mart cash). 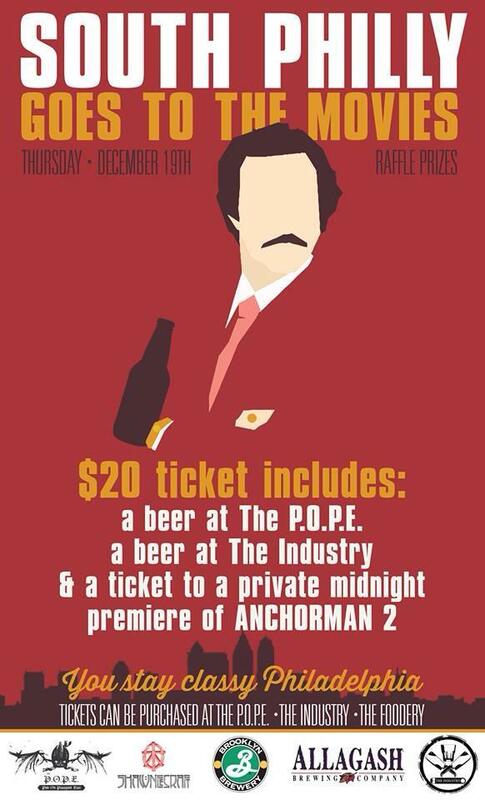 →For those of you who want the best of both worlds (arts and booze), on Thursday, December 19th, a ($20) ticket to South Philly Goes To The Movies will buy you a ticket to a private midnight premiere of Anchorman 2, a brew at both The P.O.P.E and The Industry, and entry into a raffle. What’s better than watching a man with a voice that could make a wolverine purr and suits so fine they make Sinatra look like a hobo in a theater full of people with a slight Thirsty Thursday buzz? Not much.